Website visits, conversion rates, leads per channel, engagement. All of that matters naught if your marketing team is not driving customer demand. How do you show that you are providing value to your company? Don't contribute to that 73%. Especially after all your hard work in your marketing programs and campaigns! Show that they made an impact to the business. Show that your marketing programs have Return on Investments (ROI) beyond traffic, conversion rates and social media engagement. That's why we think this eBook on 6 ROI Marketing Metrics (and how to calculate them!) would really help you! 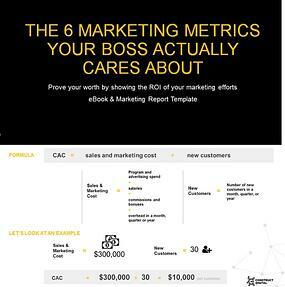 Get the eBook & Marketing Report on 6 ROI Metrics to Impress Your Boss!